Starts 8.30pm Doors 8.15pm £8.50 with advance tickets advised. Not only has Belfast's Michael Legge performed stand-up comedy all over the UK, he’s also performed as far afield as Estonia and even Russia. He’s supported comedy greats on tour such as Alexei Sayle, Stewart Lee and Dylan Moran! Michael is a regular team captain the Sony Award winning podcast Do The Right Thing as well as shouting about music with Robin Ince on Vitriola or shouting about everything with Robin in the live show Pointless Anger, Righteous Ire. Michael is considered “grumpy”. 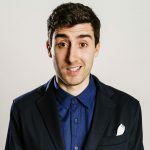 After winning the BBC Radio New Comedy Award in 2013, Steve Bugeja ( And before you ask it's pronounced Boo-Jay-A and of Maltese origin ) has popped up on Russell Howard’s Stand Up Central (Comedy Central) as well as Dog Ate My Homework (CBBC) and 10 Things You Should Know As An Adult for BBC3 in which he both wrote and performed. Steve also made a viral video for Lucozade with England footballer Harry Kane! Steve's gags and routines have appeared on The Russell Howard Hour (Sky), CelebAbility (ITV2), Mock the Week (BBC2), 8 Out of 10 Cats (Channel 4) and Russell Howard’s Good News (BBC2), Radio 4’s The Show What You Wrote and Radio 4 Extra’s topical sketch show Newsjack. Daisy Earl has quickly attracted plaudits and accolades; winning ‘Best New Comedian’ at the Scottish Variety Awards in 2015, and then being crowned ‘Scottish Comedian of the Year’ in the same year, making her the first ever female winner. If you've visited Hebden Bridge Comedy Club before then Martin Mor will need no introduction! This former circus acrobat has performed at events as diverse as the Hammersmith Apollo to a show for the inmates of an Italian prison, from comedy clubs to performing before members of the British Royal Family. As well as being Frankie Boyle's main tour support he once opened for Tina Turner! Please note. Strong language and adult themes throughout. Acts subject to change. Fully seated. Strictly over 18′s. We want all our customers to have a great night so we respectfully remind you to turn off your mobile and refrain from talking whilst the show is in progress. As comedians material is copyright any form of video or audio recording is strictly forbidden.